I’ve had quite a few degustations in my gastronomic travels, and most of them have been excellent, but there’s excellent and then there’s memorable. And in the truly memorable category, there’s only a small number – and this is one of those. Up there with Brae, Momofuku Seiobo, Orana and Oscillate Wildly, the degustation at Co-Op Dining really floated my boat! Here you can choose from the ten course signature menu for $125 or five courses for $99. This was the last Top 100 restaurant from the 2015 list that I was dining at for the year and I thought ten courses was the most fitting way to finish! Co-Op Dining is owned by Kelli and chef Kiren Mainwaring, who took over the former Dear Friends restaurant in Caversham in 2007. They’re proud of their food, and rightly so. At Co-Op they remain committed to premium quality Western Australian foraged foods and produce which is all natural, sustainable, organic or biodynamic and sourced from family-based suppliers and farmers employing responsible practices. They make their own dairy goods and butcher all of their meat in-house. Impressive. The dishes change on a daily basis so there’s no printed menu. The meal started with Chicken livers with olive and kumquat – I love livers and rarely cook them at home, so this was a great start for me – they were so juicy. Next came the Macabee Dorper lamb proscuitto and pork coppa with cucumber. I’m a huge cured meat fan – I’ve never had lamb prosciutto before and I particularly loved it for both its texture and its strong meaty (lamby) flavour. Next were the Sashimi grade Ama Ebi prawns with a salt & vinegar emulsion. Raw seafood really does it for me – fish, scallops, oysters, but I rarely get the opportunity to have raw prawns. Ama ebi translates to ‘sweet shrimp’ and these beautiful raw prawns were so naturally sweet and delicate. The next plate was tuna done two ways – Fremantle tuna tartare wrapped in nasturtium leaf and Air dried Yellowfin tuna with bottarga and basmati cracker. The following courses were Pumpkin with aerated purée and a sourdough and chorizo crumb, and then Golden beetroot with puffed buckwheat, apple purée and citrus fennel. These were followed by the Free-range confit egg yolk cooked at 62.5 degrees, macadamia purée and shavings, fried saltbush. I just love the concept of slow cooked yolks, and I’m really into saltbush these days, so I really enjoyed this dish. 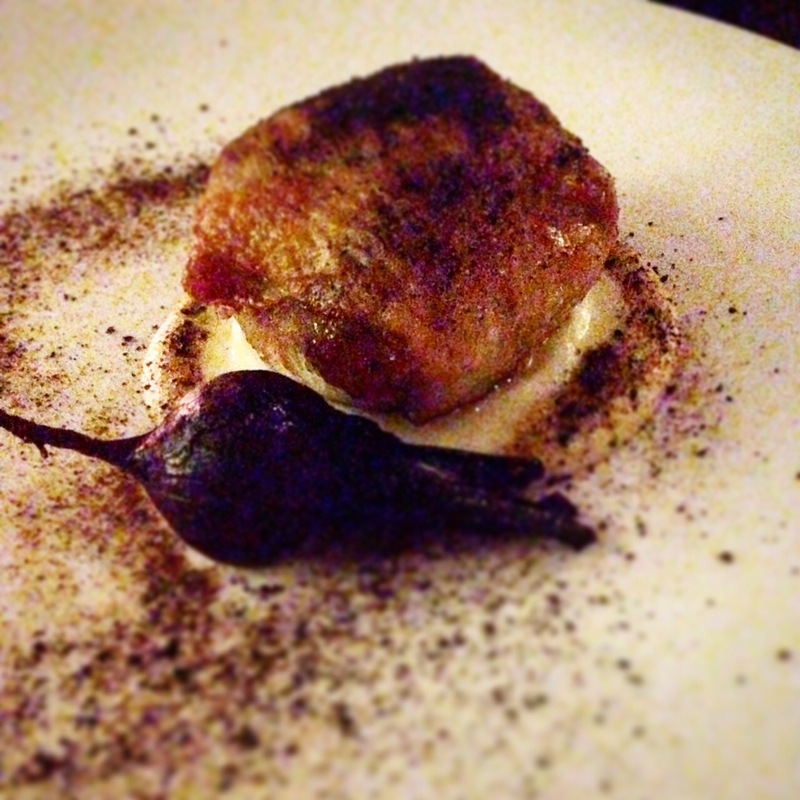 And then… the piece de resistance… the Chicken with black truffle butter, cauliflower purée, baby beet and mushroom powder. This was a dish that Kiren actually designed for the Truffle Kerfuffle Gala event in Manjimup and it was received so well, he decided to keep serving it for the truffle season. Good decision, Kiren! That chicken was so moist and succulent, and well-seasoned – it was made even more wonderful by the gorgeous oozing truffle butter! Next up, another splendid piece of meat – the Sous vide lamb rump dressed with smoked lamb fat, charcoal emulsion, South Indian spice blend and cabbage. This really delivered on flavour – a real pleasure to eat. So after all of this food already, there was the optional goat cheese course which was light and refreshing- Creamy Northam with Apple, sauerkraut. Some icy poles arrived at the table – a palate cleanser in the form of a Kombucha tea ice pole infused with elderflower. Finally, two desserts. Firstly the Grapefruit Curd, candied and fresh grapefruit, caramelised white chocolate ice cream and dill. I loved this. It was beautifully presented and the sweetness combined well with the slight grapefruity bitterness. Secondly, the Mandarin purée and segments, jelly of fermented ginger, dark chocolate and shiro miso mousse, cocoa butter crumb. Another fine dessert – the mousse was airy with a nice textural crunch. All of the dishes were so, so good and to top it off, the service was impeccable. It was such a fantastic end to what had been a week of five Top 100 restaurants and a crazy year of eating in general. Co-Op Dining is serving some extraordinary food and is definitely worth a visit.